Here’s a story about a plane that will lead on to diving. On the 23rd March 1945 a B24 Liberator, A72-80, took off from Truscott RAAF base in the northern tip of Western Australia. They had problems but the communication with the base and other aircraft is unclear. After making a circuit around the airfield the plane crashed or was ditched into Vansittart Bay. HMAS Coongoola, assigned to the RAAF Marine Section, was stationed at West Bay on the opposite side of the Anjo Peninsula to the crash. She was despatched to the scene but it was a 5 hour trip. On the first day the Coongoola recovered one body before returning to West Bay. Subsequently all crew were deemed to have been killed in the crash but only three bodies were ever recovered. The Coongoola returned on the 24th and 25th and searching continued until at least the 30th March. 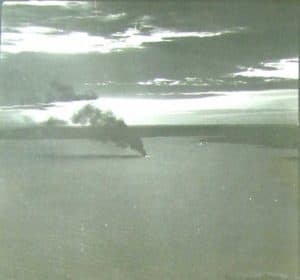 During this time the RAAF attempted to dive on the wreck of the plane but were unsuccessful as the diver was unable to stay submerged at the depth due to unsatisfactory equipment . 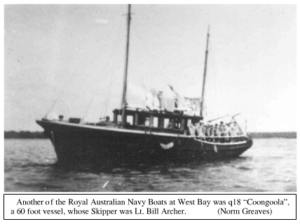 They called in the Navy and on the 30th March the Coongoola again proceeded to Vansittart Bay with navy divers on board to locate the plane. The Coongoola stayed overnight in the vicinity of the crash and returned to West Bay at the end of the day on the 31st. The findings of the Court of Inquiry stated that diving was discontinued without finding the plane due to “depth 70 feet, sea bed muddy, visibility nil, heavy tide running”. To that we could also add a couple of other factors. 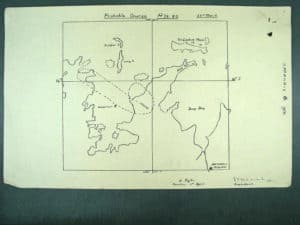 Initially the captain of the Coongoola had burning oil and later an oil slick to guide him to the plane, however he did not buoy the location. At the Court of Inquiry he was asked if he had been told to buoy the location. His response was that he had been asked if he had buoyed the location but was not asked to buoy the location. Although there was no direct criticism, the pointed questioning implied, the court was concerned by this. An eye witness reported to the commanding officer of the base that the location was approximately 100 yards off shore. The medical officer who went aboard Coongoola on the day reported that the burning oil was 400 – 600 yards off shore. Tide variances in this part of Australia are around 6m or 20 feet. Eye witnesses also reported that the plane broke up and caught fire on impact with the water. The inquiry concluded that the plane was totally destroyed and so the chances of finding anything were always slim. The inquiry followed up on several possible causes for the crash but was unable to determine the cause. How do I know this? My grandfather’s service record shows he was posted to the Coongoola from 27th March to 7th April 1945 as a short posting from his base in Darwin. That means he was one of the RAN diving team that searched for the downed plane. This story comes from the follow up research I did including official records in the National Archives of Australia, Australian War Memorial library and the web site of a son of one of the lost airmen. The web site is no longer on line. The crash site with burning oil slick. The picture shows the flight path of the crashed plane, taking off from the air strip, heading out, making a U turn, circling the air strip and then crashing into the sea just out from the air strip. The Coongoola was permanently berthed on the opposite side of the peninsula to where the crash occurred.